Lewis Hamilton beat Sebastian Vettel’s Ferrari to pole position for the Malaysian Grand Prix by less than a tenth of a second in a rain-affected Formula 1 qualifying session. Hamilton’s first flying lap on intermediate tyres in Q3 proved enough to secure top spot, as Vettel split the reigning F1 world champion from his Mercedes team-mate Nico Rosberg by qualifying second. The highest-profile casualty of the scramble for track position to get one dry lap in before the rain came was Ferrari’s Kimi Raikkonen. The 2007 world champion was delayed at the final corner trying to pass Ericsson’s Sauber (the last car to make the cut in 10th) and by being passed by Hamilton’s Mercedes at Turn 1, and wound up only 11th fastest. Scuderia Ferrari: Sebastian Vettel’s Ferrari will line up on the front row of the grid for tomorrow’s Malaysian Grand Prix, after qualifying second in a session hit by a massive storm. 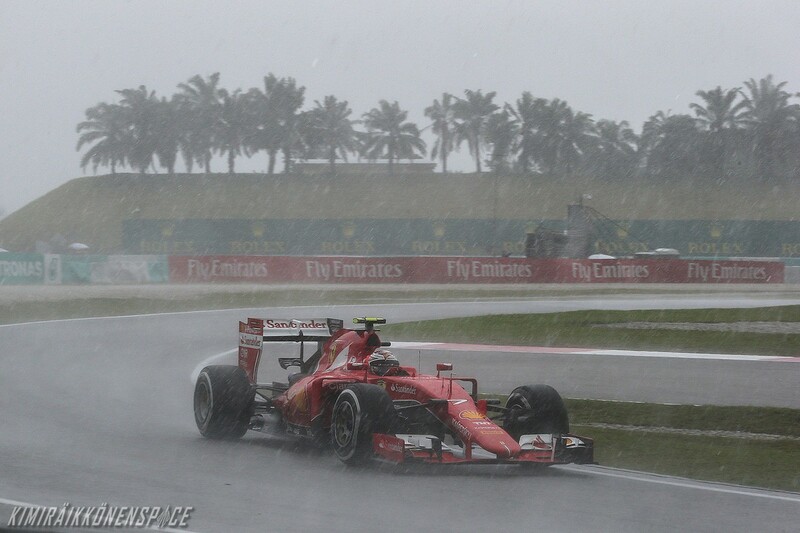 The rain arrived at the Malaysian track towards the end of the second part of the session and that meant Kimi Raikkonen, eleventh at the time in 1.42.173, was unable to make the cut into the top ten. In the delayed final part, the German steered his SF15-T to second, running two sets of intermediate tyres, with a best lap of 1.49.908, splitting the two Mercedes of Lewis Hamilton, who took pole in 1.49.834 and Nico Rosberg third in 1.50.299. But why on earth it is always him with bad luck??? I think “bad luck” who targeting him, the rain came just at the exact time to deny him. However, I wonder why Kimi did not push when leaving pit lane like everybody else? He trusted his team, as usual. Hamilton also complained after Q3 to his team for sending him out too far in the queue. Kimi was also sent out late. Vettel was first out, they should’ve ensured Kimi was second behind at least. Speechless. I dare not expect anything this riund. Kimi’s laidback personality gets the best of him. Where others like Hamil and Alonso would go straight out aggresive from the green lights, kimi tends to fire up during the race. I’ve been looking at Kimi and his starts are quite slow.